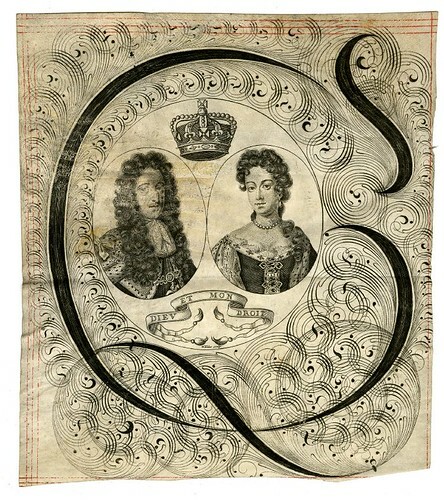 "Bust portrait of William III and Mary in state robes, in two ovals facing towards each other, printed within calligraphic flourishes; a cutting of the top left corner from a official legal document. 1690s Engraving printed from a single plate on vellum" by William Elder. "Bust portrait of William III in state robes, with garter chain, in an oval facing left, printed within a second plate with calligraphic flourishes; a cutting of the top left corner from a official legal document. 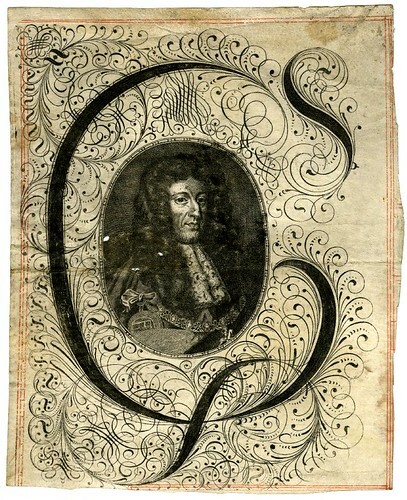 1690s Engraving printed from two plates on vellum" (Anonymous). 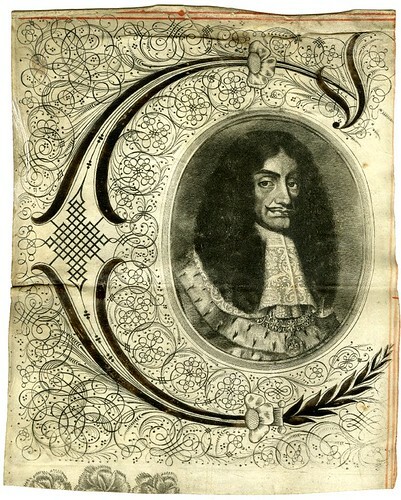 "Portrait of Charles II in penmanship, drawn in an oval with calligraphic flourishes on all sides, printed on the Thames in the Frost Fair of 1684 Engraving"
"Lettered with motto round frame, and below ''Invented, performed by command of hand & engraven by John Seddon. Carp not at what you see for tis no more than th'untaught act of one ne'r grav'd before', and 'Printed on the River of Thames, Feb.1683/4'. " "The bust of Charles is composed of calligraphic flourishes. John Seddon was the leading calligrapher of the time, and master of Sir John Johnson's Free Writing School in Priest's Court, Foster Lane. His portrait was drawn by William Faithorne (Vertue I 140), and was engraved by John Sturt as the frontispiece for his copy-books, such as 'The Ingenious youth's companion' of c.1690 and 'The pen-man's paradise' of c.1695. These were engraved after his work by others. This print declares that it was the first plate he engraved himself, and it probably remained the only one." 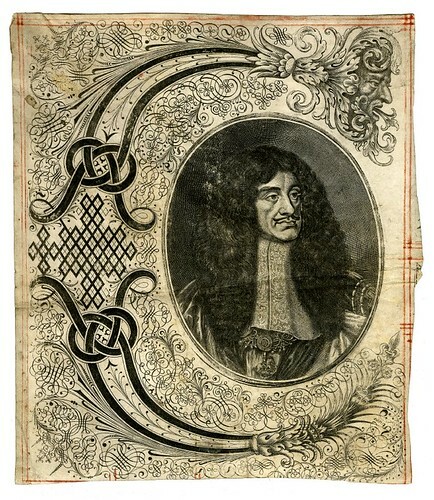 "Bust portrait of [King] Charles II in state robes, with garter chain, in an oval, printed within a second plate with calligraphic flourishes; a cutting of the top left corner from a official legal document. 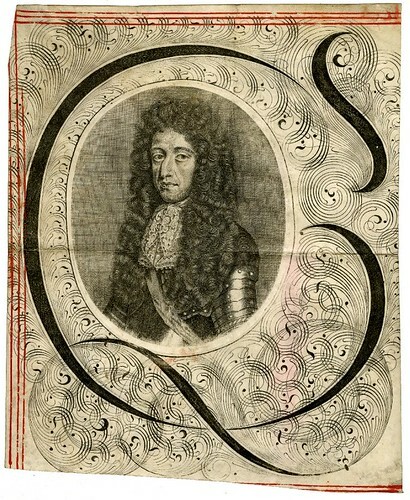 1660s Engraving printed from two plates on vellum" (Anonymous). 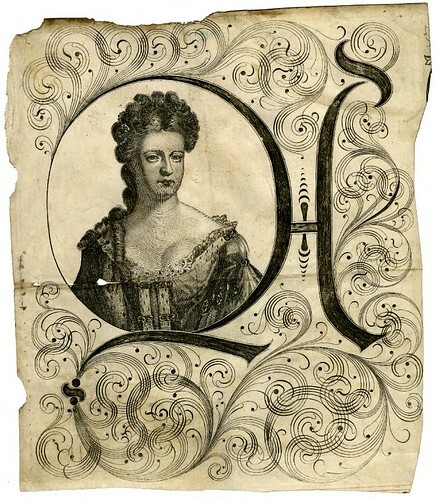 "Bust portrait of Queen Anne in state robes, with hair piled high, in an oval, printed within calligraphic flourishes; a cutting of the top left corner from a official legal document. 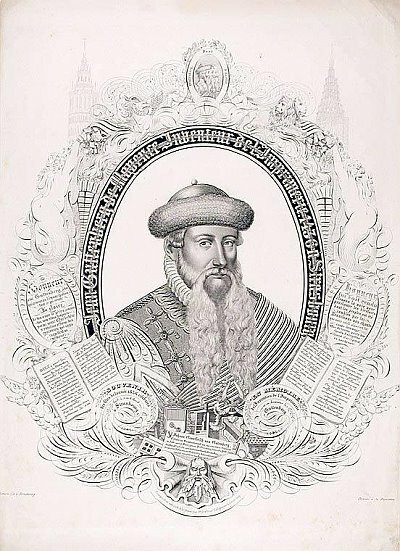 1704/14 Engraving printed from a single plate on vellum" (Anonymous). 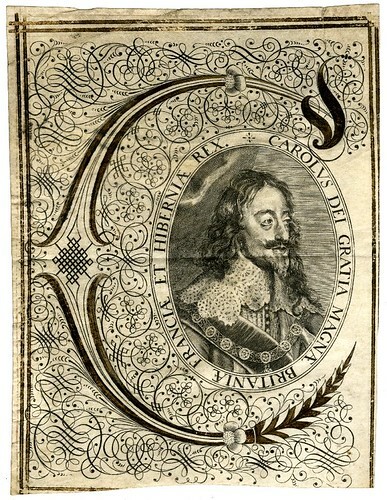 "Bust portrait of [King] Charles I in state robes, with garter chain, in an oval facing right, printed within calligraphic flourishes; a cutting of the top left corner from a official legal document. 1630s Engraving printed from a single plate on vellum with some colouring" (Anonymous). All but the last of the above images were found in the marvellous British Museum Prints Database. Doubtless there are more calligraphic portraits to be found in this style but they are fairly resistant to searching (I admit I didn't try tooooo hard). 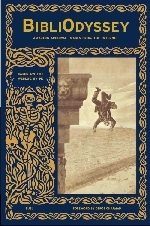 The more esoteric and specific the style or theme, the harder it is to find desirable images, seems to me. 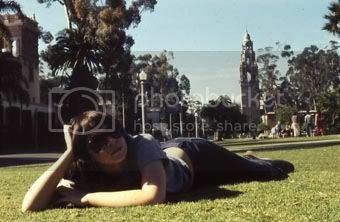 More image captions and metadata please! Once again, I am reminded of how much we seem to have forgotten. I can't imagine such things being produced today, even for a Frost Fair on the Thames! 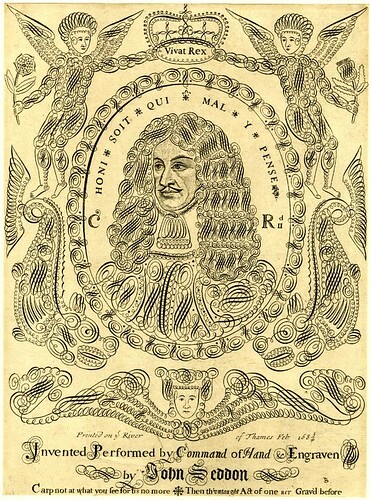 Portrait of Charles II in penmanship, drawn in an oval with calligraphic flourishes on all sides, printed on the Thames in the Frost Fair of 1684 Engraving"
Question: the printed portraits are medallions enclosed within ornamental "copperplate" style calligraphy -- is this in some, or all cases, another printing plate? The portrait composed mostly of calligraphic flourishes does from the description seem to be a master-penman's stunt, who had never cut a plate before, and applied his penwork directly to the plate on the spot. A Happening! 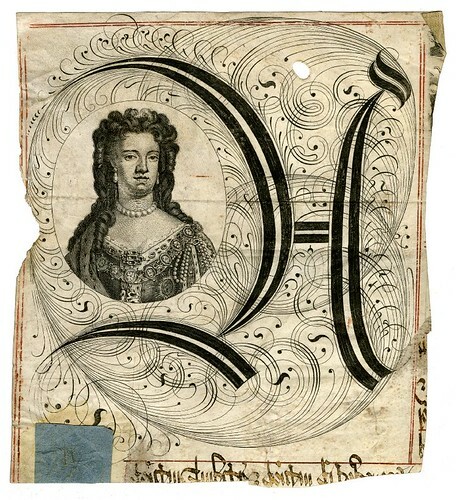 But some of these look like the ornamental penwork might have been applied directly to the pre-printed engraved portrait?? The detail of these images is really very good. Interesting how collage-like the prints feel with the work of several hands combined -- particularly that Charles cut&paste peeking out of the ornamental penwork. I'm not familiar with the period but on the second portrait of Anne you can see along the cut-off edges the contemporary legal hand writing style of the original document it was cut off from.